Aerospace company Aurora Flight Sciences and additive manufacturing firm Stratasys have designed and built a high-speed unmanned aerial vehicle using 3-D printing technology. Stratasys said Monday the UAV can fly faster than 150 miles per hour and is made of lightweight materials. Scott Sevcik, aerospace and defense senior business development manager for vertical solutions at Stratasys, noted that the UAV works to demonstrate the applications of additive manufacturing technology for the aerospace industry. The team used 3-D printing to manufacture 80 percent of the drone as part of efforts to overcome the potential cost, productivity and structural challenges with traditional methods. “A primary goal for us was to show the aerospace industry just how quickly you can go from designing to building to flying a 3-D printed jet-powered aircraft,” said Dan Campbell, aerospace research engineer at Aurora. 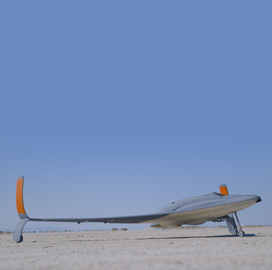 Stratasys contributed its Fused Deposition Modeling technology and Ultem material to develop the UAV, which is currently on exhibit at this week’s Dubai International Airshow.